In the fun company of Paul Holt and Marie Louise, I have just made my 15th visit to Nanpu, a small town situated on the coast of the Bohai Bay in Hebei Province, China. At this time of year the outskirts of this unassuming settlement play host to one of nature’s most incredible spectacles – the migration of millions of shorebirds from their Arctic breeding grounds to their wintering grounds in the southern hemisphere, many travelling as far as Australia and New Zealand. It is truly awe-inspiring to see, and hear, flocks of shorebirds excitedly arriving on the newly exposed mud on the falling tide and there’s nowhere better in the world than China’s east coast to witness this stunning scene…. Just listen to ABC presenter Ann Jones and Chinese birder and good friend, Bai Qingquan, describe this phenomenon in this short clip from the excellent BBC World Service/ABC radio series. A Google Earth image showing the location of Nanpu, in the Bohai Bay. We enjoyed a brilliant two days with 33 species of shorebird logged, including flocks of long-distance migrants, many of which were still in fine breeding plumage, including GREAT KNOT, BAR-TAILED GODWIT, GREY PLOVER, SHARP-TAILED SANDPIPER, the ‘Near Threatened’ ASIAN DOWITCHER and even a single ‘Endangered’ NORDMANN’S GREENSHANK. My poor quality video and photos simply don’t do justice to these birds. As we were travelling back to Beijing, I checked the news on my smartphone. The headline was about the Rio Olympics, a forward look to two weeks of celebrating the astonishing physical feats of the world’s best athletes – from 100m sprinters to marathon runners. The parallel with the shorebirds was striking. Take the Bar-tailed Godwit. One population of this species winters in New Zealand and flies, via the Yellow Sea, to Alaska and then, after raising its young, makes the return journey directly, a gob-smacking non-stop 11,000 km over the Pacific Ocean. According to scientists, this journey is the equivalent of a human running at 70 kilometres an hour, continuously, for more then seven days! Along the way, the birds burn up huge stores of fat—more than 50 percent of their body weight—that they gain in Alaska. And before they embark on this epic journey, they even shrink their digestive organs, superfluous weight for a non-stop 7-day flight. Try that, Usain! The best athlete in the world: Bar-tailed Godwit or Usain Bolt? Bolt reaches speeds of around 48km/h, with an average of 38km/h, for under 10 seconds in the 100m sprint. The Godwit’s effort is the equivalent of running at 70km/h non-stop for 7 days! Sadly, the number of Bar-tailed Godwits successfully reaching New Zealand each autumn has fallen sharply, from around 155,000 in the mid-1990s to just 70,000 today. 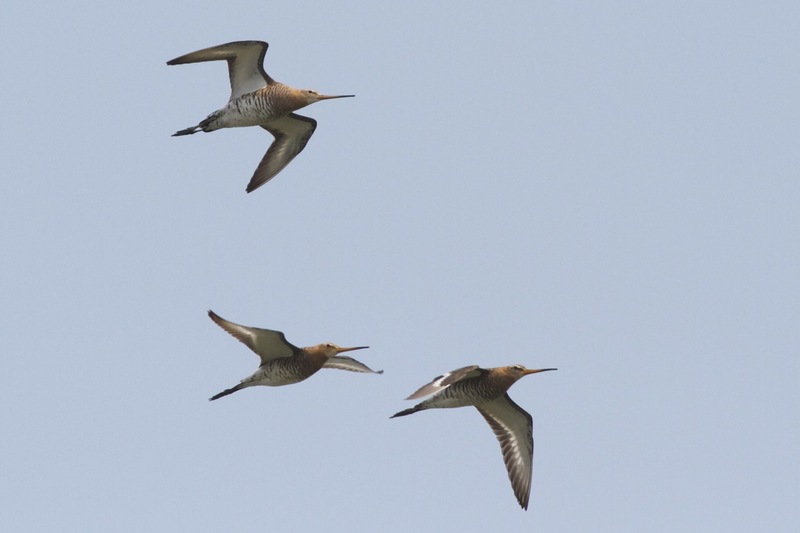 And the Bar-tailed Godwit is only one of more than 30 species of shorebird that relies on the tidal mudflats of the so-called Yellow Sea Ecoregion (the east coast of China and the west coasts of North and South Korea). The populations of most are in sharp decline, none more so than the charismatic but ‘Critically Endangered’ Spoon-billed Sandpiper. So what is the reason for the decline? 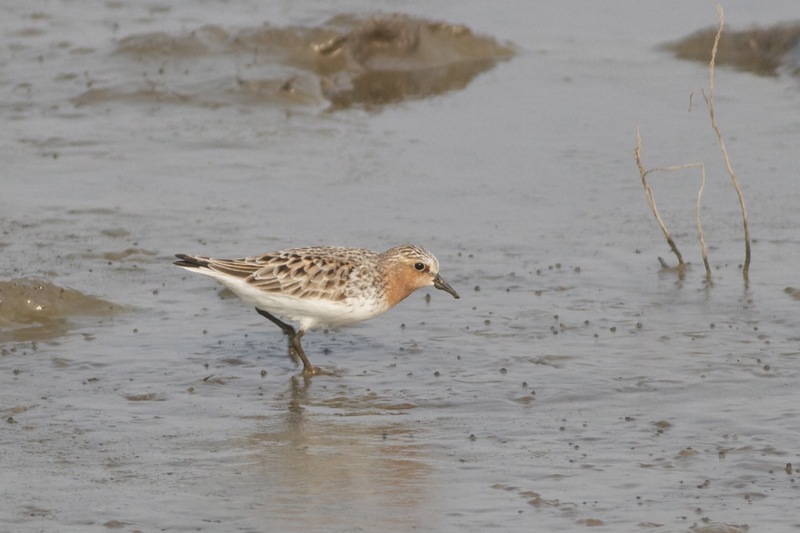 Scientists, including Prof Theunis Piersma and his team have, through years of painstaking studies, proved what many birders have long suspected – that the main cause of the decline is the reclamation of tidal mudflats along the Yellow Sea. Around 70% of the intertidal mudflats in this region have disappeared and much of the remaining 30% is under threat. If the current trajectory continues, the Yellow Sea will become a global epicentre for extinction. The problem, in China at least, is a combination of local economics and national regulations. The coastal region of China is home to 40% of the country’s population, and produces roughly 60% of national GDP. Local governments receive much of their revenue through land sales and the land that demands the highest price is agricultural land close to major cities. However, to ensure China’s food security is preserved, there is a national regulation (the Law of Land Management) stipulating that there must be no net loss of agricultural land. So any farmland sold for development must be offset by land elsewhere being allocated for agriculture. The relatively cheap reclamation of mudflats is, therefore, a profitable way for Provinces to be able to sell high-value land for development whilst conforming with the “no net loss” rule by allocating much of the reclaimed land for aquaculture. In the absence of a law protecting nationally-important ecosystems, local priorities rule. And, although large-scale land reclamation projects, at least in theory, require national level approval, these rules are easily circumvented by splitting large projects into several, smaller, constituent parts. With a booming economy over the last few decades, resulting in high demand for land, the tidal mudflats are suffering death by a thousand cuts. In South Korea, it’s a similar story. Perhaps surprisingly, it’s North Korea’s relatively undeveloped coastline that could provide the last refuge for the dwindling populations of these birds. So, what can be done? Ultimately, what’s needed is greater protection for, and more effective management of, nationally important ecosystems, including coastal wetlands, not only for migratory birds but also to avoid undermining China’s basic ecological security, such as providing fishery products, fresh water and flood control. That will require a combination of new laws, amendments to existing laws, regulations and greater public awareness. There is some great work on this, initiated by the Paulson Institute in partnership with China’s State Forestry Administration and the Institute of Geographic Sciences and Natural Resources Research under the Chinese Academy of Sciences, that makes some compelling recommendations. In parallel to these recommendations, one idea is to secure nomination of the Yellow Sea Ecoregion as a shared World Heritage Site between China and North and South Korea. The concept is based on the Wadden Sea World Heritage Site, a so-called ‘serial’ nomination of linked sites across three countries. Initiated by The Netherlands and Germany in 2009, with Denmark joining in 2014, this World Heritage Site is based in large part on its unique importance for migratory waterbirds. 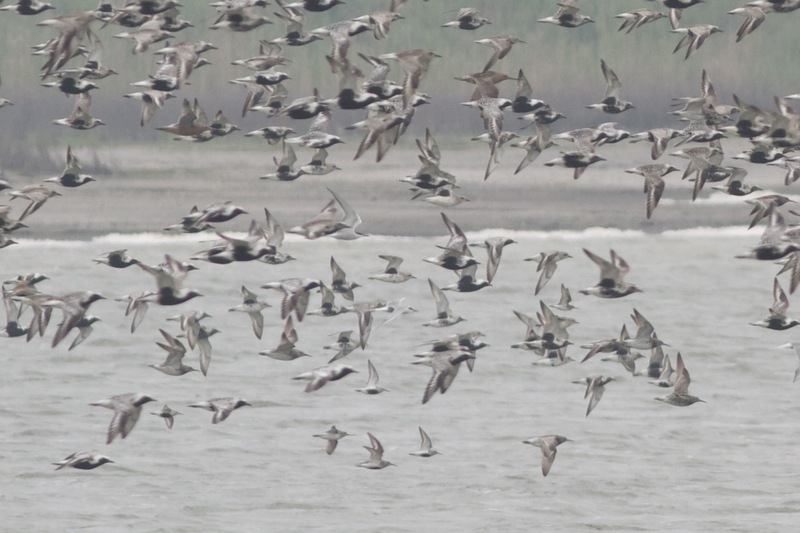 Whilst World Heritage Site status wouldn’t mean automatic protection for the Yellow Sea Ecoregion, it would give it greater national and international recognition based on its significance for migratory shorebirds along the world’s largest and most important flyway. That must be a good thing. More immediately there is much that must be done to raise awareness about the importance of these areas for migratory shorebirds, as well as local livelihoods – vital work if the conservation community is to have a chance of influencing local governments. 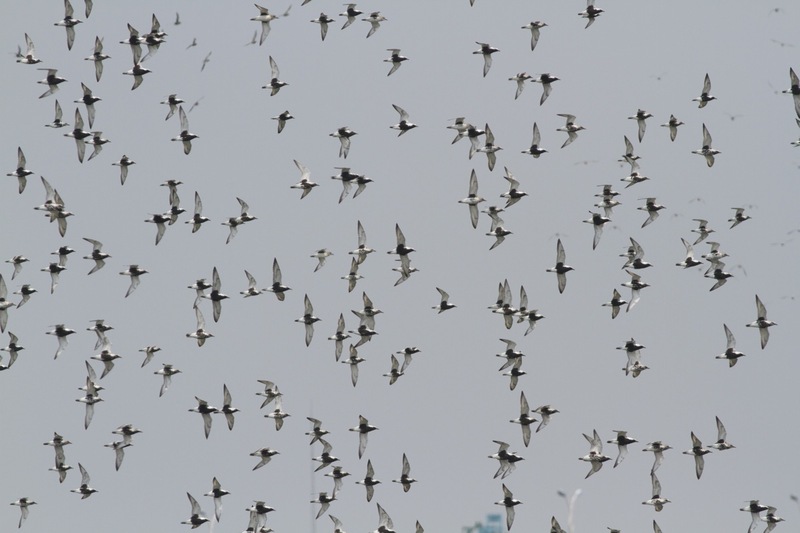 Whenever I speak about migratory shorebirds in China, without exception, people are amazed by the journeys these birds undertake and they are enthused to do something to help. Most are simply unaware that the Yellow Sea coast lies at the heart of the flyway. The good news is that there is now an increasing number of local birdwatching and conservation groups in many of China’s coastal provinces engaging local governments and doing what they can to save their local sites. 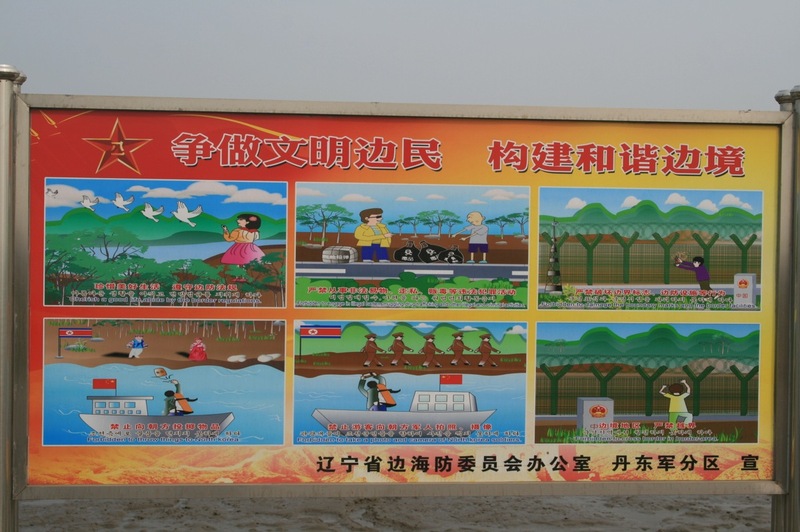 There are grassroots organisations in China working hard to promote environmental education, not only with schools but also the general public. 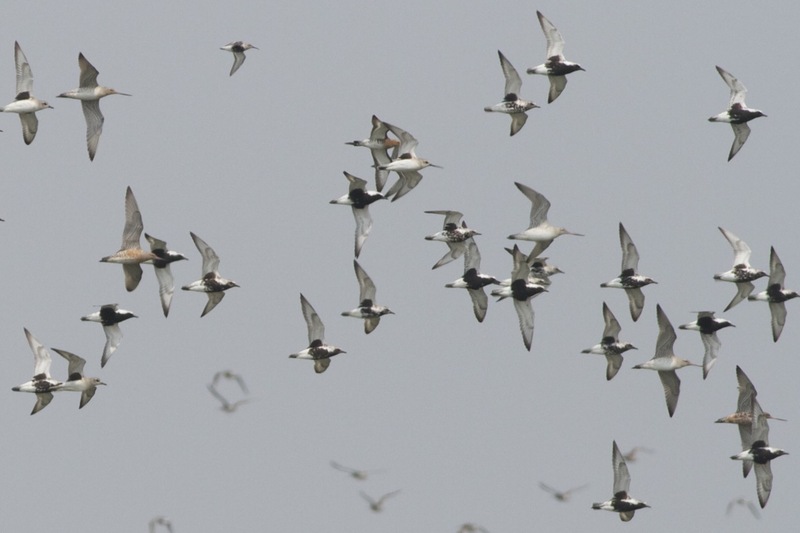 And there is a growing band of young Chinese scientists studying shorebird migration along the Yellow Sea. These groups fill me with great optimism about China’s future conservation community. 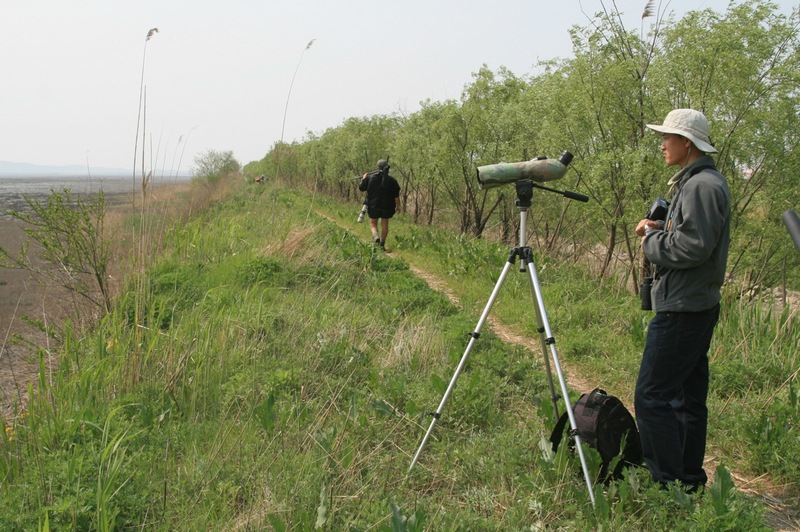 Internationally, organisations such as BirdLife, including their superb China Programme team – Simba Chan and Vivian Fu – are working with groups such as the Global Flyway Network, the East Asian Australasian Flyway Partnership, as well as Professor Theunis Piersma and his dedicated team. Together, they are advancing the concept of the World Heritage Site with the UN, governments and local groups. At the same time, I believe it is incumbent on us all to be Ambassadors for these birds, to celebrate their lives and to do what we can to promote awareness about their incredible journeys. The tidal mudflats of the Yellow Sea are one of China’s treasures, alongside the Great Wall, but they are in peril. Affording them robust protection and effective management is the highest conservation priority in east Asia and it’s a race against time. Wouldn’t it be something if, alongside the rolling coverage of the Olympics, state TV and radio profiled the most impressive athletes of all – the shorebirds of the East Asian Australasian Flyway? Photo of Usain Bolt “Bolt celebrating at the 2013 London Anniversary Games” by J Brichto used under license from Creative Commons. Another highlight from the trip to Dandong was the remarkable total of Nordmann’s Greenshanks (Tringa guttifer) that we observed at a high-tide roost. Totals of 17, 17 and 16 were recorded on my three visits and, on one of the days, local birder Bai Qingquan recorded at least a further 7 from a different location at the same time, making a minimum count of 24 at this important stopover site. Nordmann’s Greenshank is officially “endangered” with a population estimate of around 500-1,000 individuals. It breeds in eastern Siberia along the western and northern coasts of the Sea of Okhotsk and also on Sakhalin Island, wintering in south-east Asia (Bangladesh, Thailand, Malaysia etc) and is encountered on migration along coastal China from Hong Kong north to Liaoning Province. It’s population is declining, almost certainly related to habitat destruction primarily on its wintering grounds and stopover sites. We did not try to get close to these birds for fear of flushing them from their roost but the occasional pass by the local Peregrine and even the odd Black-tailed Gull kept them on their toes and, on several occasions, the flocks took to the air, allowing us to hear the air through their wings as they wheeled around in front of us.. a spectacular sight and sound. It was interesting that the Nordmann’s seemed to associate with the Grey Plover. 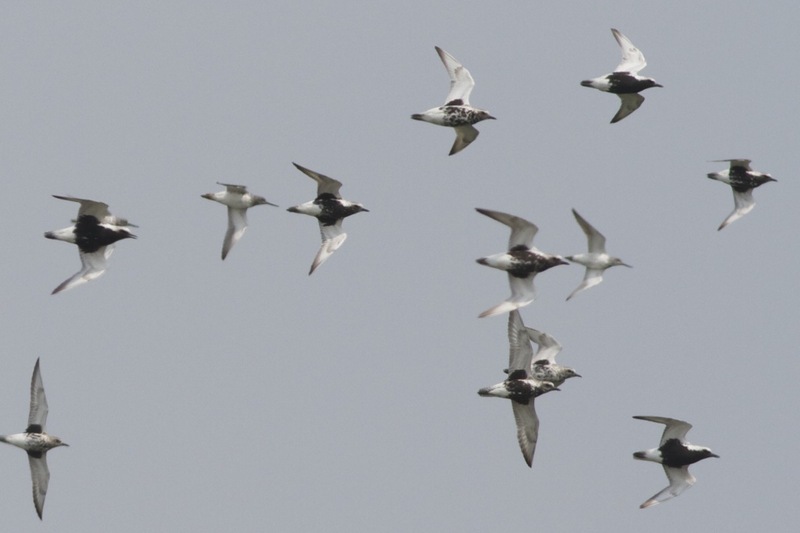 Grey Plovers, Donggang, Dandong, Liaoning Province. The wheeling flocks were a lovely sight. 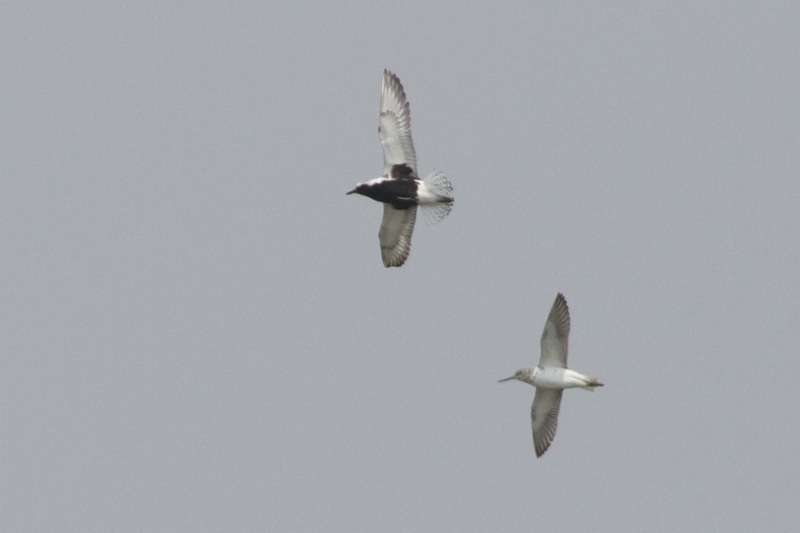 Nordmann’s Greenshank in flight (with Grey Plover), Donggang, Dandong, Laioning Province. Nordmann’s seem to like Grey Plovers! Nordmann’s Greenshanks with Grey Plovers. 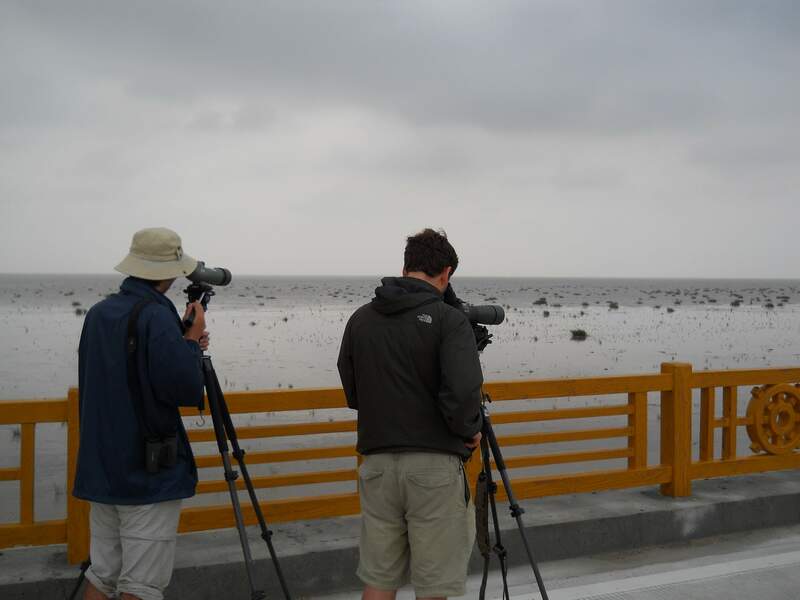 Having North Korea as a backdrop added human interest to the birding here. 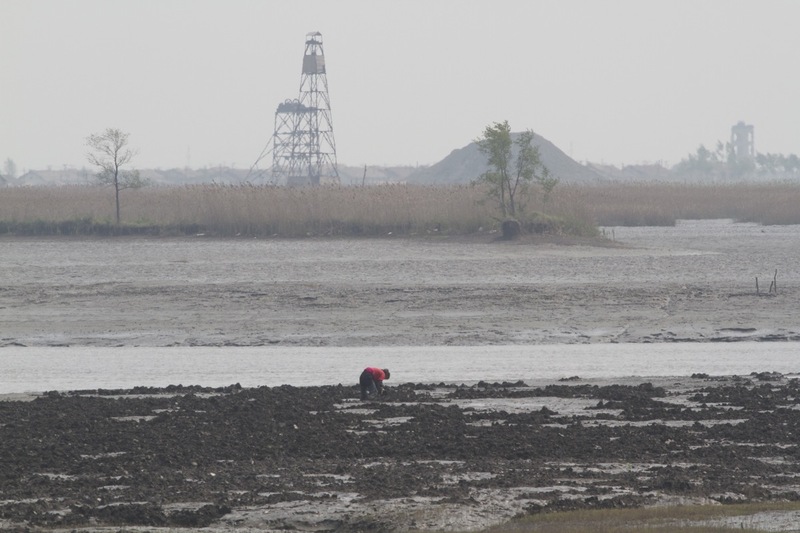 A shellfish picker works the low tide with North Korea just the other side of the Yalu river. A list of what not to do on the North Korean border. Needless to say, we did as we were told..
And other waders, most in splendid breeding plumage, were a sight to behold. 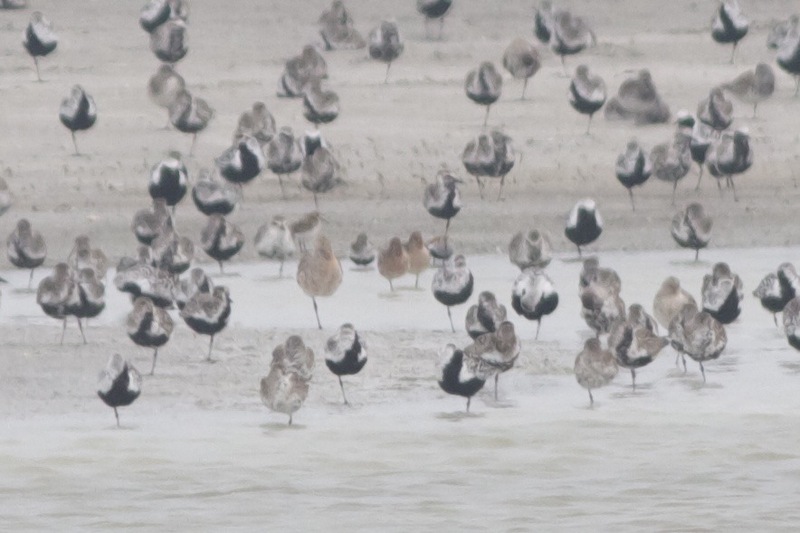 Two Asian Dowitchers (the small orangey blobs in this awful photo) were a welcome addition to the high tide roost. “Eastern” Black-tailed Godwits. Beautiful birds. Our search for Spoon-billed Sandpiper proved fruitless (a little early) but breeding plumaged Red-necked Stints were a joy to watch. Now, you’ve all heard of the “Magic Woods” at Beidaihe…. well, not to be outdone, Donggang has its own ‘not of this Earth’ site. Here’s introducing the “Harry Potter Hedge”! The “Harry Potter Hedge”… every day it would wow us with magical appearances. Out of thin air it produced a Black-winged Cuckooshrike, Rufous-tailed Robin, Siberian Blue Robin, Siberian Thrush, Eyebrowed Thrush, Mugimaki Flycatcher, Pechora Pipit, Siberian Rubythroat, Oriental Scops Owl and much much more.. 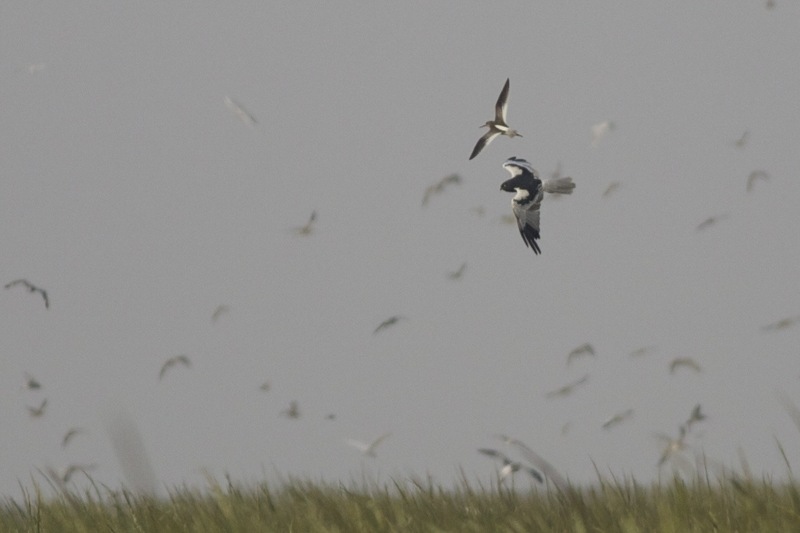 Finally, just for fun, here are a couple of photos of wader flocks… Photo 1 is beginner level. It has four wader species.. can you identify them? Photo 2 is a little tougher… it contains 6 species. A *glittering prize* awaits the first person to list them all correctly. Photo 1 (Beginners Level). There are 4 wader species in this image. Can you name them? Photo 2 (Advanced Level). There are 6 species in this photo. Can you name them? After making contact with local birder Zhang Lin, I arranged for him to guide me for two days with the primary objective to see the ‘Critically Endangered’ Spoon-billed Sandpiper. This charismatic wader has declined dramatically in the last few years and the total population is now probably in the 100s. It breeds in Siberia, around the Chukotka peninsula and winters in SE Asia (especially Thailand, Bangladesh and Burma), although the wintering area of much of the population remains unknown. China is on the migration path and ‘Spooners’, as they are often called, can be seen during the spring and autumn with Rudong (only discovered in 2008 as a site for this species) one of the most reliable and accessible sites. The adventure began on Sunday evening when I caught an overnight train from Beijing to Shanghai. The trains are very modern, fast, reliable and clean, with very comfortable bunks (4 to a cabin). And the current journey time of 9 hours will soon be cut to around 5 hours when the new high-speed rail link comes online in 2011. The demand for tickets is high, though, so advance purchase is recommended. Frustatingly, tickets cannot be bought more than a week or so ahead of travel due to “the rules” and this year, due to the Expo being held in Shanghai, demand is higher than usual. All this combined to mean that there were no bunks left for my outward journey, so I had to make do with a ‘soft seat’ instead. These were airline style with partially reclining chairs in rows of 3. I had a window seat which at least meant I had the window to lean on and, incredibly with the help of an eye-mask and ear plugs, I managed about 4 hours sleep. On arrival at the spanking new and impressive Shanghai railway station, I was met by Zhang Lin and we began the 2-3 hour drive north to Rudong. Driving on rural Chinese roads is not for the faint-hearted with a combination of trucks, cars, rickshaws, motorcycles, suicidal pedestrians and all sorts of weird motor vehicles providing constant entertainment. Fortunately our driver was very skilled in navigating these obstacles and it wasn’t long before we were doing our first birding, at a wetland site just before the estuary. Here we were greeted by Long-tailed Shrike, lots of ‘eastern’ Yellow Wagtails, Hobby, Red-rumped Swallow, Hoopoe, Oriental Reed Warbler, Richard’s Pipit, Chinese Pond Heron, Little Egret, Yellow Bittern, Little Grebe, Arctic Warbler, Oriental Pratincole, Black Drongo and White-winged Black Tern. 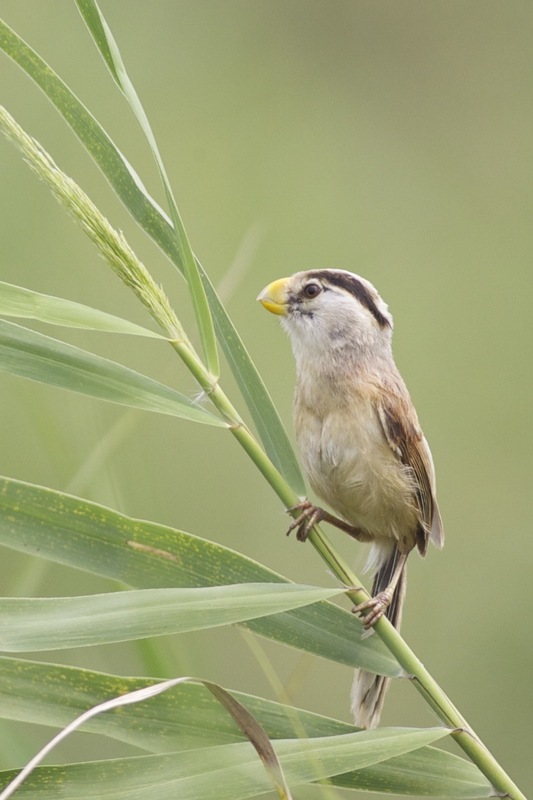 Soon, Lin picked up the distinctive calls of the Reed Parrotbill, a very charismatic endemic. Small flocks of these weird-looking birds were calling from the reeds and, with a bit of patience, we were able to secure excellent views as a pair came to investigate our presence. Soon after this encounter, we added Plain Prinia, Common Kingfisher, Cattle Egret and Chinese Bulbul to the list. Our return walk back to the car unexpectedly produced 3 Pechora Pipits that perched on wires for a few minutes before heading off south-west. Nice! We then drove on to the estuary but, with high-tide several hours away, Lin took me to the woods, a relatively young stand of trees planted along part of the seawall (the land here was reclaimed to build wind turbines and several massive Vestas turbines towered over us as we birded the track (a reminder of Denmark!)). Here was full of migrants with Eastern Crowned Warbler, Pale-legged Leaf Warbler, Asian Brown Flycatcher, Dark-sided Flycatcher, White’s Thrush, a cracking male Siberian Thrush, Black-naped Oriole, Striated Heron, Blue Rock Thrush, Forest Wagtail, Dollarbird, Grey-headed Lapwing, Red Collared Dove and Oriental Turtle Dove. After a thoroughly enjoyable couple of hours we headed for lunch at a local seafood restaurant (lots of squid, shellfish, fish and lovely Chinese dumplings). Yum. Anyway, we met up with Tong Menxiu (who is temporarily based in Rudong to make daily counts of Spooners until the end of October), and set off for the mud flats. The plan was to walk a short distance (around 200-300 metres) onto the flats to await the small high tide roost at this site. Often Spooners come into this roost site and, with patience, they will gradually come close, sometimes as little as 10 metres away. Today, we were not so lucky – no Spooners in this roost – but there were 6 Nordmann’s Greenshanks, Common Greenshank, Redshank, a Long-toed Stint, Greater and Lesser Sandplover, a Great Knot, Far Eastern and Eurasian Curlews, Red-necked Stint, Grey Plover, Broad-billed Sandpiper and a Sharp-tailed Sandpiper. Suddenly the whole group took to the wing and it meant only one thing – a raptor. A quick scan produced a male Pied Harrier quartering the area.. simply stunning. High tide came and went without me getting my feet wet but, given that there were no Spooners in the roost, Lin suggested we walk further out towards the slowly expanding feeding grounds to try to see them there… this involved wading through several muddy creeks, some of which were waist deep and with patches of very sticky mud, whilst trying to keep my rucksack and optics free of water and mud – not easy! My tripod came in very handy as a third leg… The walk was around 1.5-2km through this terrain before we eventually reached the open flats with literally thousands of feeding birds. The timing of the tides meant that we probably only had about an hour left of daylight, so we began to scan in earnest, Lin from the left and me from the right. After only a couple of minutes, Lin said he could see a Spooner. My heart raced – would I really connect with this sought-after wader? He offered me his scope and seconds later I was watching my first ever Spoon-billed Sandpiper! Wow.. I soon found it in my own scope and I watched it avidly for several minutes – a non-breeding plumaged adult – as Lin scanned for others. The Spooner seemed to have three feeding actions, two of which were very different to the confusion species – Red-necked Stint. The first was a sort of Snipe-like digging, with three to four vertical ‘drills’, all of the bill going deep into the mud. The second was a sort of a Spoonbill-like ‘sweep’ from side to side or a ‘shovel’ straight ahead. And the third was a more Red-necked Stint-like poking at the surface. After a few minutes the bird flew and I lost it, so I began to scan and, amazingly, I found my own Spooner! This one was an adult moulting out of summer plumage with some rufous colour still on the throat – a stunner. I watched this bird for about ten minutes as Lin scanned the rest of the flock, picking up one more adult in non-breeding plumage. The feeding technique of the Spoon-billed Sandpiper is a very good initial identification feature, especially at distance. They tend to run around with their head down and the distinctive ‘shovelling’ or ‘drilling’ means that you can often tell them apart from Red-necked Stints at quite a distance. With the light fading, we had to head back.. I knew the walk out had taken us about an hour and I knew it would be dark well before that so I was relieved when Lin said we would be taking a short cut back across a relatively deep creek (waist high again) that is not passable at anything other than low tide. Thirty minutes later we were on a track and were met by our driver, who took us to a local restaurant for a celebratory seafood meal, accompanied by the local beer.. I was very happy! We then retired to the small local hotel where the rooms were comfortable, if a little basic, with a shower and air conditioning. For about GBP 12 per night, it was pretty good. Day two began wet and windy (the remnants of a typhoon) so we visited the wood again, as it would provide at least a little shelter. We got a drenching but with the temperature around 30 degrees C, it was not unpleasant and we soon dried out when the rain stopped. The morning produced Red-billed Starling, Chinese Grosbeak, Siberian Blue Robin, Northern Hawk Cuckoo (easily mistaken for a hawk! ), Japanese Sparrowhawk, Pale-legged Leaf Warbler, Dark-streaked Flycatcher, Asian Paradise Flycatcher, Black-naped Oriole and another two Siberian Thrushes. 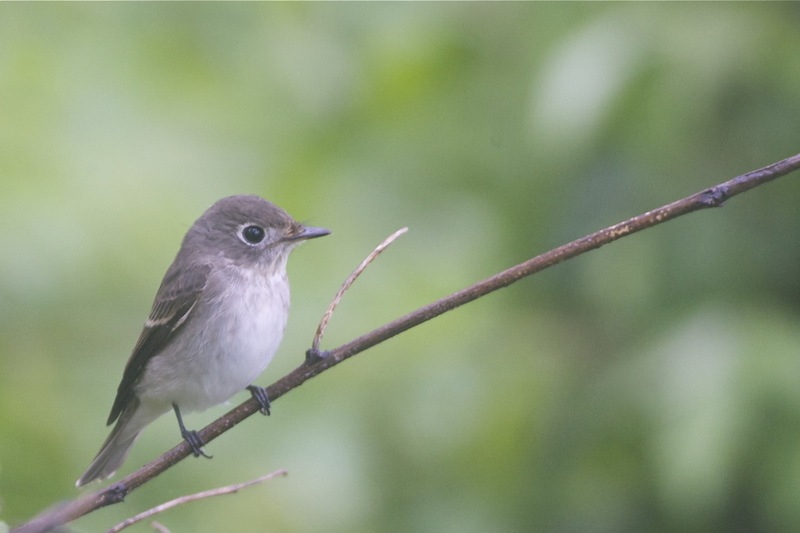 An adult male Blue and White Flycatcher added a splash of colour and a juvenile Tiger Shrike was a nice addition to the list. And so, after another seafood based lunch, we set out to look for more Spooners. This time we sat on the sea wall a few kilometres away from yesterday’s site and watched the birds as they gradually moved closer with the incoming tide. Again, lots of waders were present of many different species. New additions here included a Grey-tailed Tattler and several Marsh Sandpipers. But no Spooners. So with the tide reaching its peak we headed to the area behind the sea wall, the favoured high tide roost here. We walked out towards the largest of three flocks of roosting birds. A painstaking scan failed to show any Spooners but there was a nice roosting flock of Saunders’ Gulls with a few Black-tailed Gulls mixed in. With the tide now receding, we went back to the sea wall to watch the waders as they began to leave the roost to feed.. Here, the birds were pretty close, feeding avidly and, again, Lin soon found an adult in non-breeding plumage, closely followed by a second. I watched one of the birds for about 10 minutes, knowing that it would be my last sighting before the journey back to Beijing. I felt very privileged to be watching this small wader, especially in the knowledge that the species may already be beyond the point of no return. With threats on its wintering ground from hunters and coastal development, many of its migration stopover sites already lost, and almost all of the remaining sites under threat from development, the future is not bright. But where there is life there is hope and I will be keeping my fingers crossed that the international effort to save the species from the brink of extinction is successful. The world will be a poorer place without this charismatic bird. Reluctantly, we tore ourselves away to begin the drive back to Shanghai. I was tired but elated. Thankfully, I had a sleeper berth on the journey back to Beijing and I managed to sleep for around 6 hours before arriving back at Beijing South Station at 0730. To see a stunning displaying adult male Spoon-billed Sandpiper on its breeding grounds, click here. And for David Sibley’s Spoon-billed Sandpiper resource, including investigation of why the species is disappearing so fast, click here. I also recommend the series of 6 posts about the SBS on the top birding blog, “10,000 Birds“. The interview with SBS expert, Christoph Zöckler, is particularly revealing.